QDOS is an service which measures a person's digitial presence, which is a formula based on the person's popularity, impact, activity and individuality. QDOS index fluctuates overtime, and was most evidential in my recent absence from Internet play. The charting application (not shown here) can plot a person's QDOS over time. I wish that there is a way to chart multiple person over time though. According to today's report, I have higher influence than Julia Stiles at the moment, having a Q4916 (the higher the better) and a ranking of #2,166 out of 67,660 actively tracked profiles. To put things into perspective, Robert Scoble has Q6064 (ranking #628) while Pete Cashmore (Q7313) is at #187. Barack Obama has a Q11733 and is the top-ranked person at the moment, followed immediately by Britney Spears, 50 Cent and Beyonce Knowles. What's your QDOS like? 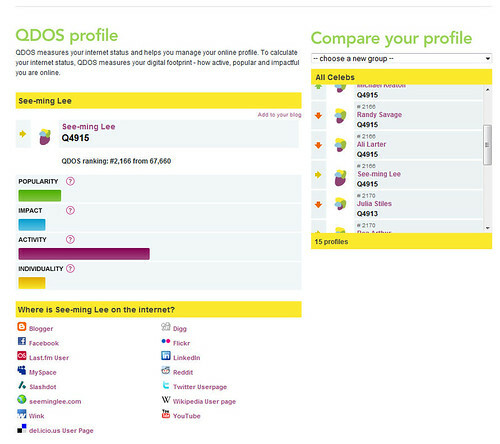 Find your QDOS and post a screenshot on Flickr.